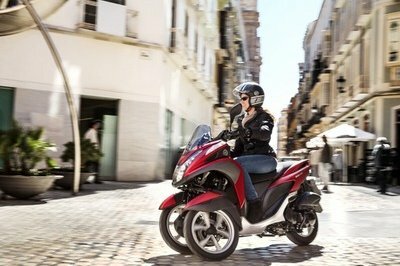 The BV 350, dubbed Beverly, from Piaggio is win-win as far as scooters go. With a big 16-inch wheel up front, monster-size brakes usually seen on full-size motorcycles, an assortment of tech acronyms, and an ample touring windscreen, the Beverly is a downright proper little touring scooter. 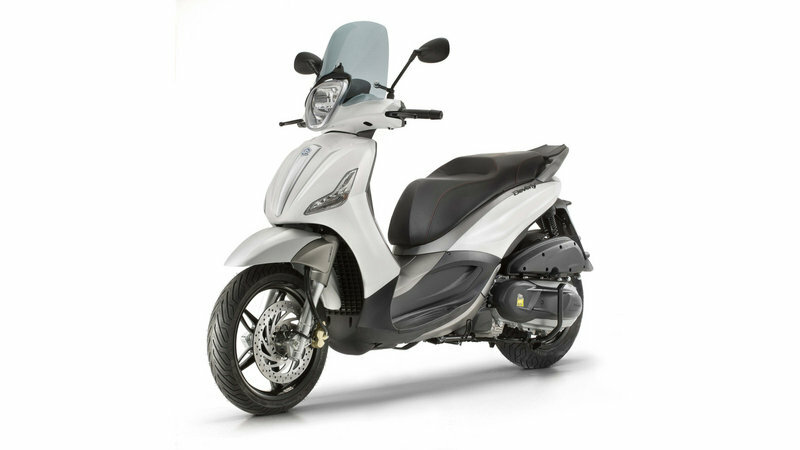 As a commuter in the city or suburbs or for your weekend getaway, the BV 350 fits right into the niche that Piaggio intended. 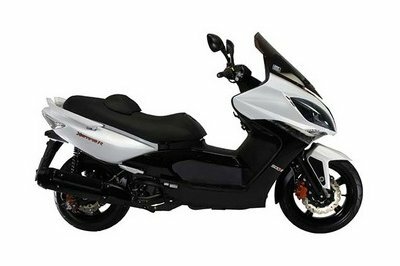 With a lively throttle response and plenty of power and torque to back it up, the Beverly puts “sport-touring” into scooter vernacular. 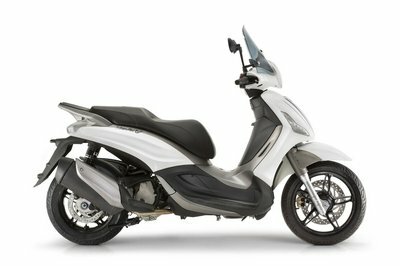 Continue reading for my review of the Piaggio BV 350 ABS. The two-up seating is wide and comfortable — wide enough to support even an ample derriere, but the front of the seat narrows enough that short folks like me can scoot forward and put our feet down at stops. 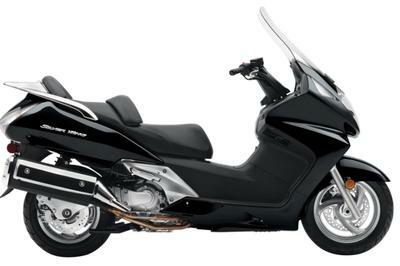 Big grab handles and pull-out passenger footpegs will keep your pillion-person secure and comfortable and the big rear rack offers plenty of room to bungee some gear or mount a top case from the accessories catalog. 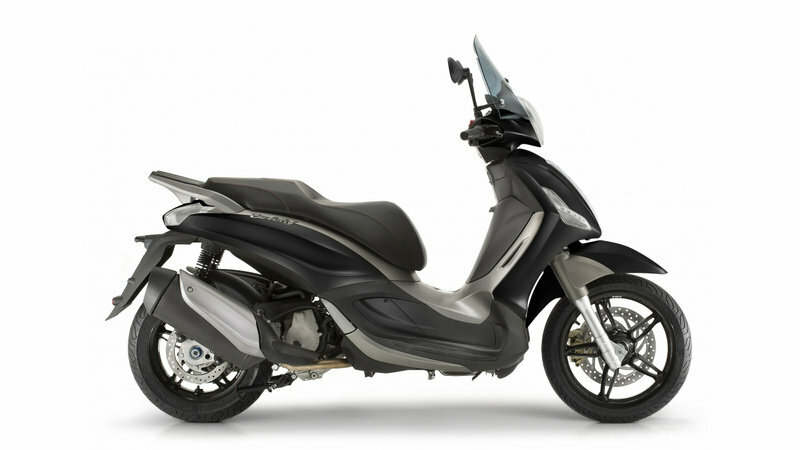 Although the body shape and high-rise tunnel in the step-through suggest a monocoque chassis, Piaggio runs a proper, double-cradle frame made of high-tensile steel tubing instead of going the “stressed-skin” route. This feature makes the scooter somewhat more durable since damaged body panels can be replaced, and the scooter saved, in the event of a wreck where a unibody might be looking at a “totaled” classification. Plus, the shop can repair said damage without touching any cutting or welding equipment, and that’s a bonus in my book. Frame construction leaves us with a 31-inch seat height, and the 35 mm, telescopic front forks push the wheel out for a 61.4-inch wheelbase and 83.1-inch total length. Dual, coil-over shocks spring off the swing-mount motor assembly, and they come with a four-position preload adjuster so you have a little bit of adaptability for changing conditions and variable cargo and passenger loads. Piaggio didn’t mess around with any of the teeny-tiny, lawn-cart wheels we see all too frequently on little rides, but instead used a full-size, 110/70-16 front hoop and a still-bigger-than-usual 150/70-14 in back. 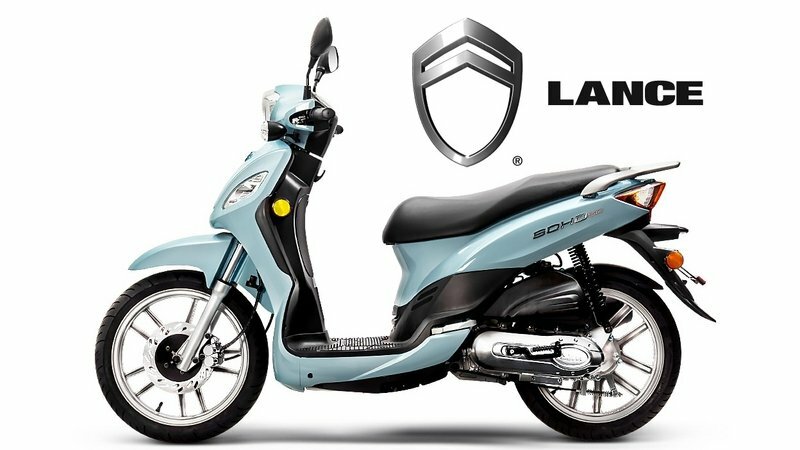 Not too shabby for a scooter, and the wheels certainly inspire more highway confidence than the usual 10- to 12-inch fare. Speaking of confidence, the brakes certainly inspire loads of it, and I ain’t kidding. The little BV 350 sports a massive 300 mm front brake disc, larger than some full-size bikes out there, with a 240 mm disc in back, equal to same. This represents quite a bit of braking power, perhaps a little much for a ride with a 390-pound dry weight, but a standard ABS feature prevents loss of traction due to overbraking, so you can use those big ’ol brakes with confidence. In spite of its name, the 78 mm bore, 69 mm stroke and combustion-chamber volume actually add up to a total displacement of 330 cc. The factory managed to shoehorn four valves into the head, run by a SOHC system, and liquid cooling carries off the waste heat. Dyno numbers speak to a fun little ride with a claimed 32.8 horsepower at 8,250 rpm, and 23.8 pound-feet of torque at 6,250 rpm, sufficient for a lively ride around town or for short hops up the highway. This mill comes EPA and CARB approved, and it drives the Beverly up to 86 mph with fuel consumption in the 65 to 70 mpg range. MSRP on the BV 350 is $6,399 for 2017, up $200 from last year and up $500 from 2015. The colors available for 2017 are the same as last year: Nero Opaco Carbonio and Bianco Stella — that’s Matt Black Carbon and White Star for those of you whose Italian is a little rusty. Piaggio covers your ride with a two-year unlimited-mileage warranty and throws in one year of road side assistance for free. Gotta love these big-wheel scooters, but it adds a whole dimension when looking for an apples-to-apples competitor. 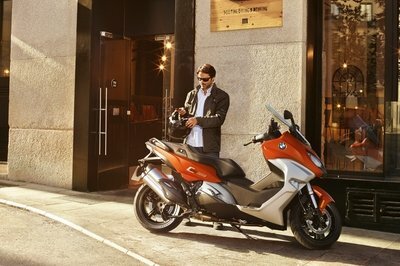 The Lance Soho 50 has 16-inch wheels, but the engine size is too small to go up against the BV 350. 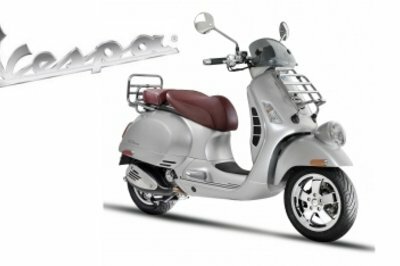 I might go with the GTV 300 from Vespa; but in this case, I’ll give it pass since they’re both under Piaggio. For this go-’round, I’ll look at the Forza from Honda. It doesn’t have quite 16-inch wheels, but the engine size is close enough for a look-see. Visually, both rides display a certain grace and elegance. Usually I expect the Italian influence to win the beauty pageant, but this time Honda beats them, hands down. Instead of a handlebar-mounted windshield atop fixed leg fairings, the Forza sports a fixed, one-piece front fairing that more closely resembles a full-size sport-tourer with a somewhat chopped-down but broad windscreen. Honda also graces the Forza with a more generous seating area, but the tunnel almost completely blocks the step-through on the Forza, so the Beverly is certainly easier to mount. All that extra body paneling adds up, and the Forza is a bit on the heavy side at 422 pounds wet. The Beverly weighs in at 390 pounds dry, for about a 20-pound difference once juiced up for the road. 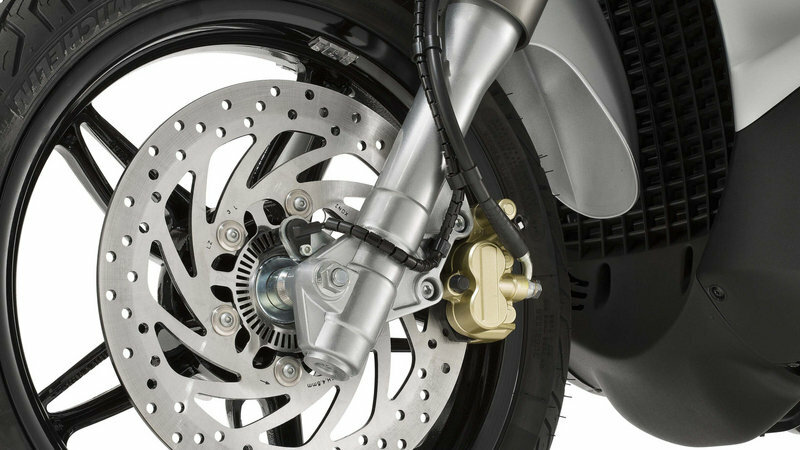 Honda stops short in the brakes department with a fairly typical 256 mm disc up front, much smaller than the 300 mm Piaggio uses, but I’m proud to see both scooters ditch the old drum brake and set up a proper disc on their rear-wheel drive units. The BV 350 enjoys a slight displacement advantage with 330 cc versus the Forza with its 279 cc engine. 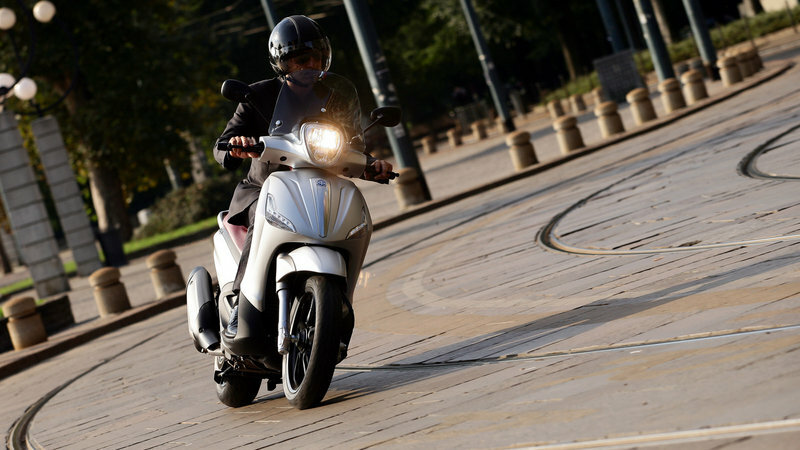 Both run as four-cycle engines with water cooling and electronic ignition, but Piaggio gets the wizardry ribbon with its traction control system and wet centrifugal clutch. The size difference shows up in the performance numbers; unofficial-but-respected sources report 24.5 ponies and 19 pounds of grunt out of the Forza motor, a little shy of the 32.8 horsepower and 23.8 pounds of torque we see from the BV 350. 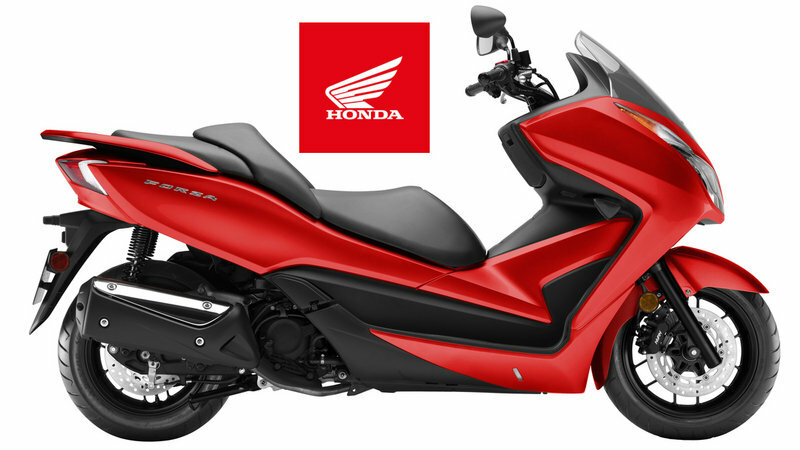 Honda pulls off a win in the price category with a $5,599 starting price, a full eight bills shy of the $6,399 Piaggio. Sure, traction control is nice, and I would be comfortable calling it much more than a novelty, but new riders on a budget might consider it an unnecessary expense, and they would be half-right. It is an expense, but one that could save your bacon one day.